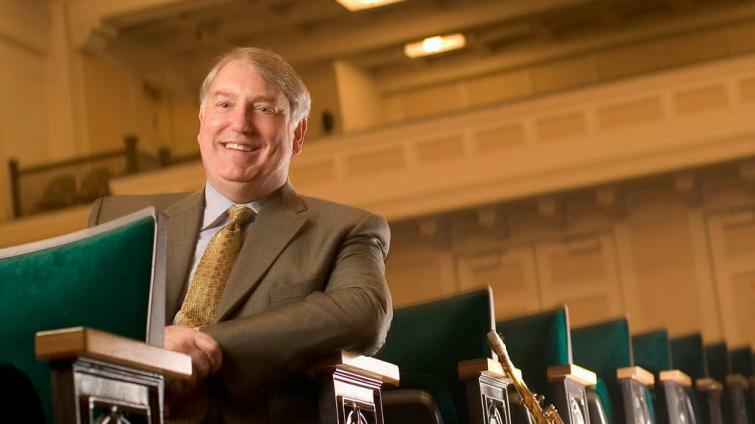 Brad Foley, dean of the School of Music and Dance, has decided that his 16th year at the University of Oregon will be his last as dean, as he prepares to step down at the end of the next academic year and return to the faculty. This is a bittersweet announcement. Brad’s leadership will be missed, but our students will benefit from his return to the studio and the classroom and the sound of his saxophone again filling the MarAbel B. Frohnmayer Music Building. The school has enjoyed great success during Brad’s tenure as dean. Most notably, curricular offerings have been significantly broadened, facilities have been renovated and expanded, and the financial future of this critical area is strong. In fact, the school has raised more than $37 million to benefit music and dance students since his arrival in 2002, with an endowment that has more than tripled. Brad will leave his successor a school that is the envy of many in the academy, built on a foundation of performance excellence, technology, and a commitment to diversity. In the coming years, Brad will not only teach classical saxophone and chamber music, he has also agreed to lead and direct our ChamberMusic@Beall series, which is celebrating 50 years this season. Search details for a new dean of the School of Music and Dance will be available on the Provost’s website soon, but for now, please join me in celebrating the exceptional career of Brad Foley and his contributions to the University of Oregon.